Brian Blades, along with his brother Bennie were members of Jimmy Johnson‘s University of Miami squad during the late 80s. 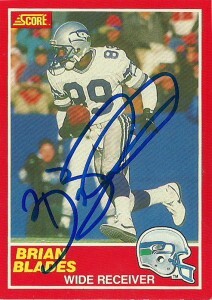 Brian would be drafted by the Seattle Seahawks in the second round of the stacked wide receiver 1988 draft that included such names as Tim Brown, Sterling Sharpe, Anthony Miller, Wendell Davis, and Willie “Flipper” Anderson being taken off the board before Blades’ name would be called near the back end of round two. The Seahawks were looking for a compliment or replacement for long in the tooth, Hall of Fame shoe-in Steve Largent. A bit undersized at 5-11, Brian made up for it with his route runnning and hands. He would make a nice fit for the ‘Hawks, and put in decent numbers his rookie season starting 7 games and making 40 receptions. 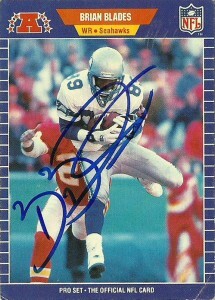 In 1989, he’d have his best season as a pro earning AP marks with 77 receptions for 1063 yards and 5 TDs. 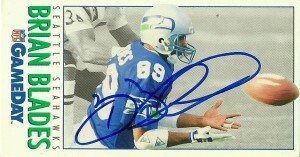 The torch was effectively passed, as Largent retired after the season. A disappointing 1990, with teams easily double teaming Blades would shut him down, halving his numbers. (It also didn’t help that quarterback Dave Krieg had an increasingly short amount of time to function in the pocket.) The Seahawks would decide to rebuild drafting signal-caller Dan McGwire in the first round of the 1991 draft, jettisoning Krieg to free agency. In the meantime the team would go through a series of coaching changes and a quarterback carousel. Despite everything Blades would break the 1000 yard barrier again that season, before an injury plagued 1992 took his season after 6 games, but he’d quickly returned to form posting 2 back to back 80+ catch seasons, and a 77 catch season in 1995. Over the next 3 final seasons, Brian’s career would be consumed by personal tragedy, after a gun discharged accidentally fatally injuring his cousin in 1996. He’d be placed on trial and be found guilty of manslaughter, but the charges would be dismissed by the judge, within hours based on lack of evidence. His numbers would decline due to injury, and he would retire before the 1999 season. Blades played his entire 11 season career with the Seahawks and the team would honor him with an induction into the team’s 35th anniversary team. I always got he and his brother Bennie confused but none the less, you could always count on Brian on Tecmo Super Bowl to come through in a pinch for the punchless Seahawks. I got Brians autograph in about 100 days on these 3 dynamic cards.